Posted on October 31, 2017 at 3:53 pm. The operator of the River Rock Casino Resort in Vancouver has hit back against allegations it failed to follow the appropriate anti-money laundering processes. The Canadian casino has featured in several media reports recently, which allege the venue accepted millions of dollars in chips from Chinese high rollers who paid in $CAD20 notes. While casinos in Canada aren’t required to report suspicious transactions to the financial intelligence unit, FINTRAC, operators do have to submit reports on unusual activity to gambling regulators, such as the British Columbia Lottery Corporation (BCLC). 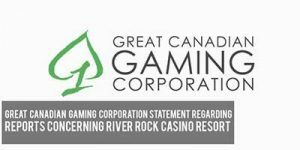 The casino’s parent company, Great Canadian Gaming Corp (GCGC), released a statement after the Vancouver Sun reported the operator met with managers of the BCLC regarding a 2014 transaction where $645,000 worth of chips were purchased using small notes. According to the Canadian media outlet, River Rock executives told BCLC not to intervene with the high roller casino player who was behind the unusual buy-ins. However, since the VIP opened a patron gaming fund (PGF), which is a non-cash casino account which only takes direct deposits from major banks, the BCLC reportedly became concerned about the $645k cash transaction. However, FINTRAC has reportedly slammed BCLC’S lack of mediation when it comes to suspicious transactions, according to a letter from the intelligence unit last year. FINTRAC claimed the BCLC discovered that River Rock had not properly trained its employees in anti-money laundering processes. But Baker said the casino employees “followed all procedures required of them by BCLC”. He added that the staff had been crucial to identifying certain individuals in the Royal Canadian Mounted Police investigation, where two individuals were charged with money laundering offences last week in British Columbia. The Progressive Conservative Party of Canada wants the Ontario government to put the deal with GCGC on hold. Under the deal, the GCGC would control and run three of the Ontario Lottery and Gaming Corporation’s (OLG) casinos in the Greater Toronto Area. “We are calling on Premier Wynne to step in and halt this deal in Ontario immediately,” PC finance critic, Victor Fedeli, said on Monday. Mr Fedeli said that the allegations, including the incident involving high rollers paying for chips with “hockey duffel bags full of cash” should put an end to the deal. He added that he wants to know what the Ontario government knows about the claims. “Either they knew about it and didn’t have that play into their decision, which means they’re derelict in their duties, or they didn’t know about it, which also means they’re derelict in their duties for not knowing,” he said. Toronto Premier, Kathleen Wynne, added that the OLG has clear anti-money laundering policies enforced at an event on Monday, after being questioned about the media reports. “The minister has already spoken with OLG and it’s certainly something given what has happened in British Columbia that we’re paying close attention to,” she added.